Invisalign consists of a series of virtually invisible clear aligners that you replace every two weeks. Each aligner is custom-made and is designed to progressively shift your teeth into proper alignment. Because each aligner is specially made to an exact calculation to fit your bite and smile, you can rest assured that we will be creating a smile that truly fits you. Are you feeling self-conscious about your crooked or gapped smile? It is okay to be extremely self-conscious about your smile! We have the ability to change that using one of the most revolutionary orthodontic treatments ever created, the Invisalign system. We will first start by examining your mouth, including your teeth, jaws, jaw joints, and muscles, and view them as a complete functional system and decide whether Invisalign is the correct treatment. If we determine that Invisalign is the appropriate treatment for you, we will proceed to take precise impressions of your teeth using the latest 3-D digital imaging technology using the Cadent scanner and sending these images to Align Technology. Align Technology will then create your custom aligners based upon our instructions. Each set of aligners is worn for two weeks, shifting your teeth gradually, millimeter by millimeter, every week until the very best results have been achieved. The typical turnaround on a full Invisalign treatment is usually about 12 months; however, each case is different and may require more or less time. Invisalign Express consists of a maximum of 10 trays in the system, which is a minimum of 20 weeks of treatment not including retainer treatment. This is for cases that require little movement, mild crowding, and mild to no rotation. 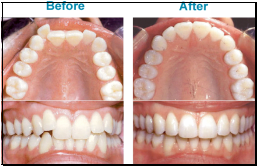 It is a great system for rebound cases of people who had braces before. Unlike traditional metal braces that everyone can see, Invisalign is almost completely invisible and undetectable. Invisalign will not hold you back, because you can completely remove your aligners to eat, drink, brush, and floss. You will also enjoy the comfort of not feeling irritation to your gums and cheeks, because, unlike traditional metal braces, Invisalign has smooth edges. Invisalign Teen patients are now finding it easier to smile. Like its predecessor, Invisalign, Invisalign Teen uses a series of removable, clear plastic aligners that straighten a teen’s smile millimeter by millimeter, week by week. Invisalign Teen can be used to treat overly crooked teeth, crowded teeth, widely spaced teeth, overbites, crossbites, and underbites. Only a certified Invisalign Provider can determine if Invisalign Teen is the right orthodontic treatment for you. After consulting with us and if it is determined that Invisalign is the right treatment for you, impressions of your teeth are made using scanner and the aligners are then constructed using the latest in 3-D technology that map your teeth’s movement. These new teen-targeted aligners are shaped in a way that allows your permanent teeth to grow in with ease. They have a Blue Dot Wear Indicator, which fades away every two weeks, thus letting you know when a new set of aligners are needed. Invisalign Teen easily adapts to a teen’s busy and active lifestyle by offering free replacement aligners should they get lost. If it is determined that Invisalign is not the appropriate treatment for you, we will refer you to an orthodontist who will be able to straighten your teeth using conventional wire braces. For a Free, No Obligation Invisalign Teen consultation, call us for an appointment.